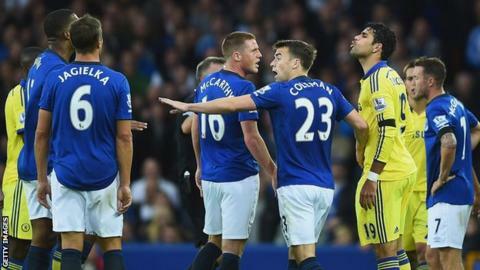 Everton manager Roberto Martinez says Chelsea striker Diego Costa needs to learn to show his opponents respect. The £32m signing from Atletico Madrid scored twice and was booked in a 6-3 win at Goodison but clashed with Seamus Coleman after the latter's own goal. Chelsea boss Jose Mourinho felt Everton players tried to aggravate Costa. But Spaniard Martinez said: "There are certain foreign players who come to the Premier League who need to understand the ethics and the culture." Costa was involved in an altercation with home keeper Tim Howard after the striker appeared to goad Coleman about the own goal that put Chelsea 3-1 up. Martinez added: "The behaviour in the British game is unique. "The last thing you want to see is disrespect from a player to another player and I am sure he will learn that very quickly. "There is a real professionalism and respect in the league so you can understand why the players weren't happy with that, in the same way as trying to buy free-kicks with the way he plays." Costa has now scored four goals in three Premier League appearances as Chelsea maintained their 100% start to the season. However, he has also been booked twice, having also received a yellow card in Chelsea's 3-1 win at Burnley in their Premier League opener when he was adjudged to have dived. Mourinho feels Brazil-born Spain international Costa is being unfairly targeted by opposition players. "To be chasing cards against a player who once more had good behaviour and was just here to play football is disappointing," said the Portuguese. "At the end of the story, Diego is maybe the best player in the Premier League in the first three matches and he has two yellow cards - one against Burnley where he didn't simulate, it was a penalty, and one against Everton, when everyone was chasing him to get him in trouble. Costa opened the scoring after just 35 seconds against Everton, running on to a perfectly-weighted pass from another new arrival, Spain team-mate Cesc Fabregas. Everton barely had time to recover before Branislav Ivanovic made it 2-0, firing in after being put through by Ramires. Kevin Mirallas halved the deficit just before half-time to give Everton hope, until a remarkable spell of five goals in 10 minutes settled the encounter in Chelsea's favour. Eden Hazard's shot deflected off Coleman to make it 3-1, prompting the episode that saw Costa confronted by Howard. Moments later, Steven Naismith pulled one back with a precise finish before Nemanja Matic's shot skidded in off Sylvain Distin to restore Chelsea's two-goal advantage. Former Chelsea striker Samuel Eto'o then marked his debut with a deft header, only for Ramires to make it it 5-3. Costa rounded off the emphatic win when he got his second and Chelsea's sixth with a low, angled finish late on. "I can imagine it was a great game to watch from a neutral point of view but our point of view was that we started too slow," added Martinez. "But even then I felt we showed great character and great belief and I felt we were getting back into it, but every time we did we were dealt a sucker punch."